Who would have guessed that the contemporary buildings of Greece’s expanding provincial towns would provide study material for architectonic explorations? Yet it was here that, in the concrete frames of houses-under-construction, an architectural exploration began into the foundations of structure. Before they are plastered in white and pink and hung with all sorts of tasteless ornaments, the Greek concrete skeletons are like modernist buildings, not unlike those of Mies van der Rohe. For the artist Oscar Lourens, they form a perfect study into the essentials of the use and the dimensions of space. Like Darwin did in South-America with biological specimens, Oscar Lourens did in North-east Greece with houses under construction: he registered and captured them, in Lourens’ case with the use of a digital camera. 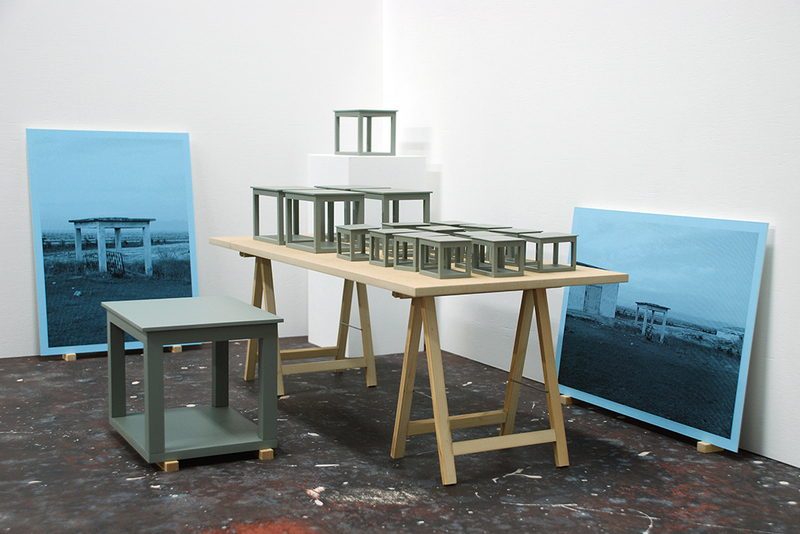 Back in his studio, Lourens meticulously reconstructed the buildings from the images on a 1:20 scale. Lourens’ aim however, was not solely to collect and file the buildings, but to investigate what would happen with the meaning of an object when it was resized and placed in a different setting. Indeed, instead of copying the original structure, the reconstruction transformed the object. Even though Lourens never deviated from the original photographic blueprint, the result of his work was no longer the original semi-manufacture, a house on its way to completion, but a completely new and finished product. The model turned out not to be a model at all. One of Lourens’ study objects was the prototype of all buildings: Glikoneri. It was probably a garage-under-construction in the village of Glikoneri in Greek Thrace, and it was perfect in its simplicity. Glikoneri had all that is needed for a house, nothing more and nothing less: four columns and a roof on a concrete foundation. Oscar Lourens made models of Glikoneri in a 1:10 and 1:20 scale, as well as a 1:4 model. The latter was interesting. By resizing the original to a 1:4 for scale, the archetypical building of Glikoneri was transformed into the basic structure something completely different. In the setting of Lourens’ studio, Glikoneri became a life size table. The PROBE exhibition is an exploration of dimensions, in which everything – the exhibition room, its doors and all the works of art – is made on a 1:4 scale. 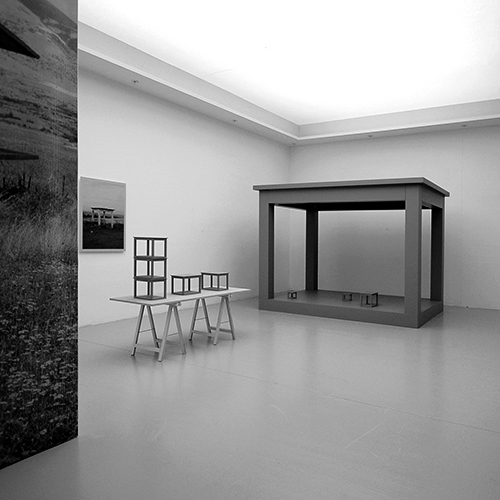 Oscar Lourens exhibits the Glikoneri models in the PROBE exhibition room. But for PROBE he needed to make a model of the first model. The PROBE models relate to the actual structure on the scales of 1:40 and 1:80 – tiny cubicles of only 3.25 cm high. In the PROBE exhibition something interesting happens. When all dimensions are resized in the same way, nothing happens in the eyes of the observer. In harmony with each other, the changed dimensions uphold the appearance of the original size. But what will happen when this harmony is broken and an odd-sized Glikoneri is placed in the room? 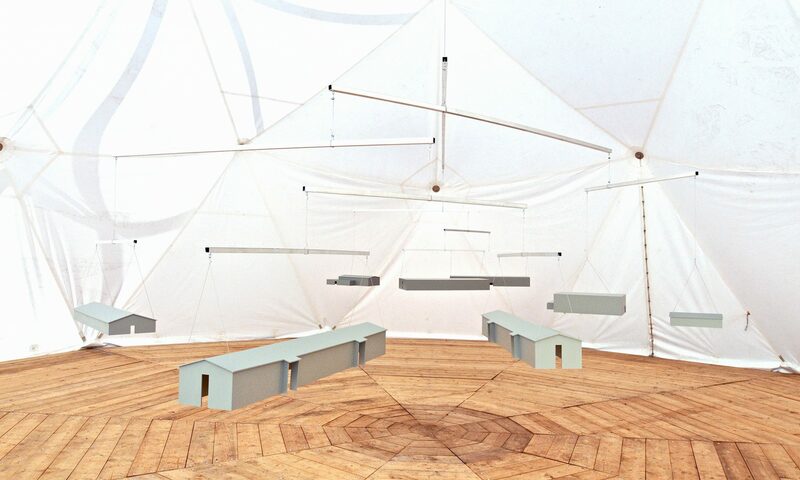 Oscar Lourens added the ‘table Glikoneri’ to PROBE; a 1:4 model in a 1:4 exhibition room. And indeed, in the scale confinement of PROBE, what appears to be a table in real life, transforms back into the garage. Quod erat demonstrandum: it is the relative size, not the actual that renders meaning to an object.